In 2007, e-IGNiTION was commissioned to develop an innovative website for Archipelago Cape Verde (ACV), who operate tailored ethical adventure holidays to the Atlantic island chain. Building on the exclusive and sustainable themes that the company holds dear, we produced an innovative design concept that translated throughout the site. 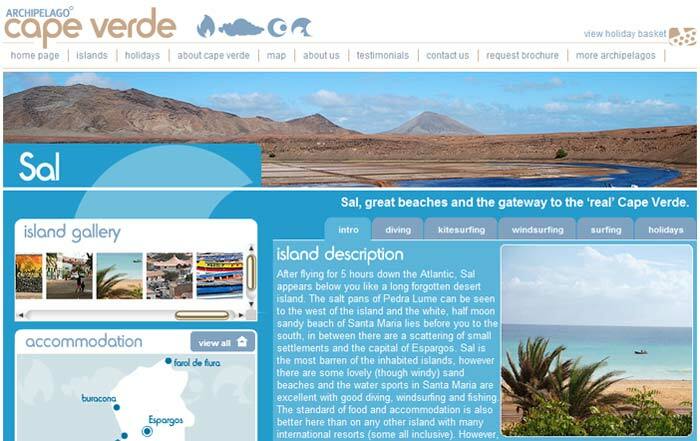 Using Flash imagery in a considered way, we built interactive archipelago islands and integrated dynamic icons for information on Cape Verde, holidays, hotels, flights and activities. The site was since shortlisted for a Travelmole 2008 Award for Best Tour Operator Site, and has proved to be extremely popular with the Company and its customers. In an effort to drive an increased number of visitors to and conversions from the site, ACV had embarked on a Google Adwords Campaign. Concerned that this Pay Per Click (PPC) Campaign was neither economically sustainable, nor as effective as it might be in driving visitor conversions, e-IGNiTION’s Search Engine Marketing team was brought in to work on the existing online marketing strategy and begin work to integrate the company’s strategy with its online presence. Since we became involved, we have significantly increased clicks and conversions on the Adwords Campaign, however, we now believe that the best approach for ACV is to improve their organic rankings through a targeted Search Engine Optimisation implementation. Using analytics tools to review existing site traffic and the routes that users are taking around the website, we have already started to work on the site layout and content to improve search engine rankings and user conversions. An effort is being made to assist the client in their link building back to the site. The initial work has identified the relevant directory sites for their business and also those sites hosting backlinks for their competition. From here a cohesive plan for the coming months can be built. This case study was posted on Thursday, May 1st, 2008 at 5:35 pm.